Texture Jewelry - This is a handcrafted bold textured Sterling Silver pendant featuring a natural round blue and green Azurite cabochon. This sculptural One-of-a-Kind necklace comes with an 18" sterling silver snake chain. Handcrafted sterling silver pendant created from textured silver and silver tubes. The pendant is accenting a round azurite cabochon stone. This beautiful pendant hangs from an 18" sterling silver snake chain. 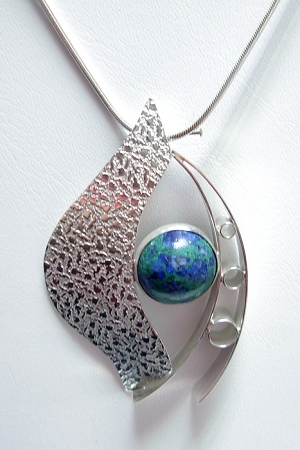 This piece has a wonderful contrast between the texture and shiny silver. Signed and created by Aaron Rubinstein and Modern Art Jewelry.